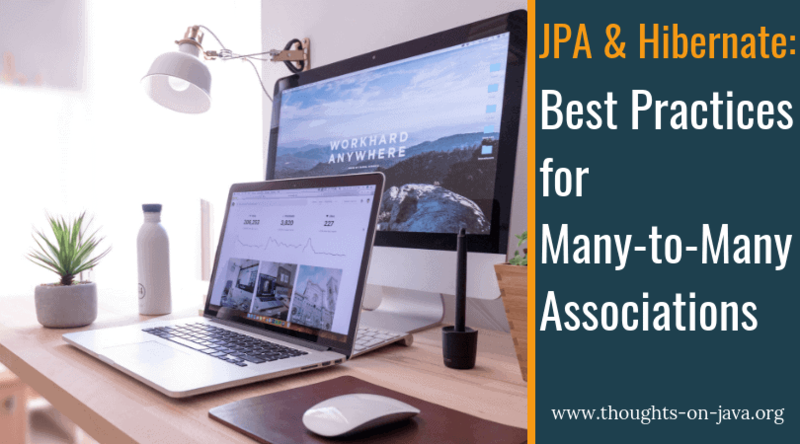 Many-to-Many associations are one of the most commonly used associations with JPA and Hibernate. You can find lots of examples for them in the real world, and you can map them with JPA and Hibernate as a uni- or bidirectional association in your domain model. I will not dive into the details of a basic many-to-many mapping. If you are not exactly sure how to create such mapping, please take a look at the many-to-many section in my association mapping guide. Most developers don’t spend a lot of thoughts on the data type of a to-many association. They just choose a java.util.List because it’s simple and doesn’t perform any checks to avoid duplicates. That’s OK, if you implement a basic Java class or if you model a One-to-Many/Many-to-One association. But you should never use a List if you model a Many-to-Many association. Hibernate handles remove operations on Many-to-Many relationships that are mapped to a java.util.List very inefficiently. It first removes all records from the association table before it inserts all remaining ones. 09:54:28,876 DEBUG [org.hibernate.SQL] - update Book set title=?, version=? where id=? and version=? 09:54:28,878 DEBUG [org.hibernate.SQL] - delete from book_author where fk_book=? You should instead model a many-to-many association as a java.util.Set. Hibernate then handles remove operations on the association much better. It now only removes the expected records from the association and keeps the others untouched. 10:00:37,709 DEBUG [org.hibernate.SQL] - update Book set title=?, version=? where id=? and version=? 10:00:37,711 DEBUG [org.hibernate.SQL] - delete from book_author where fk_book=? and fk_author=? Bidirectional associations are mapped to an entity attribute on both ends of the relationships. So, in the previous example, you have an authors attribute on the Book entity, and a books attribute on the Author entity. That makes implementing a JPQL or CriteriaQuery very comfortable because you can use these attributes to define a JOIN clause. But adding or removing an association gets more complicated. You always need to perform the change on both ends of the association. For example, if you want to add a Book to Author, you need to add it to the books attribute of the Author entity, and you also need to add the Author the authors attribute on the Book entity. Otherwise, your current persistence context contains inconsistent data which you will use until the end of your current transaction. Utility methods on your Author and Book entities make updating and removing much easier. Within this methods, you perform the required operations on both entities. This is a quick one. You should always use FetchType.LAZY for your many-to-many associations. It tells your persistence provider not to fetch the associated entities from the database until you use them. That’s usually the case when you call its getter method for the first time. Luckily, that’s the default for all to-many associations. So, please make sure that you don’t change it. And if you want to learn more about JPA’s different FetchTypes, please take a look at my Introduction to JPA FetchTypes. If you’re using FetchType.LAZY, you need to know about query-specific fetching. Otherwise, your application will be very slow because you created lots of n+1 select issues. When you load an entity and use query-specific fetching, you tell Hibernate which mapped associations it shall initialize for each fetched entity. It then extends the SELECT clause of your query so that it includes the columns mapped by these other entities and initializes the associations. 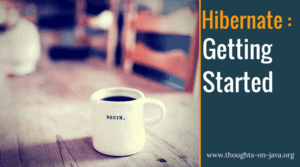 And because the associations are already initialized, Hibernate doesn’t need to perform an additional query when you access its getter method for the first time. You can implement query-specific fetching in several different ways. The simplest one is a JOIN FETCH clause, which I will show you here. But you can also use a @NamedEntityGraph or an EntityGraph, which I explained in previous articles. The definition of a JOIN FETCH clause is almost identical to a simple JOIN clause in a JPQL query. You just need to add the FETCH keyword. Even so, a JOIN And a JOIN FETCH clause look very similar, the JOIN FETCH clause has a much bigger effect on the generated SQL query. It not only gets translated into a SQL JOIN, as it’s the case for a JPQL JOIN clause, it also forces your persistence provider to extend the SELECT clause by all columns that are mapped by the associated entity. If you activate cascading on an association, your persistence provider applies the operations you perform on the entity to all associated entities. If it does that for all operations or just for a few selected ones depends on the configured CascadeType. That might sound like an amazing idea that makes the implementation of your business logic much easier. And that’s not entirely wrong. But please avoid the CascadeTypes REMOVE and ALL, which includes REMOVE, for many-to-many associations. In the best case, it only creates performance issues, but in the worst case, it might also remove more records than you intended. I explained both pitfalls and their solution in great details in a previous article. Or if you want to keep it simple, trigger the required information programmatically on the associated entities. This might require a few more lines of code, but it avoids any unexpected side effects. Model associations as a java.util.Set. Provide utility methods to add or remove an entity from an association. Always use FetchType.LAZY, which is the default, to avoid performance problems. Apply query-specific fetching to avoid n+1 select issues. Don’t use the CascadeTypes REMOVE and ALL. Basically, you should best avoid *ToMany relationships. Unscalable at best, a pain to maintain. Using ad-hoc queries doesn’t come with these problems. I don’t agree with that. If you follow a few rules, to-many associations work great. I explained the ones for many-to-many associations in this article.